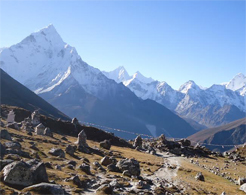 Jiri to Everest Trekking is one of two alternative gateways to Everest, the highest peak of the world. Jiri-Everest route is considered relatively easy route to reach the last resort of mountaineering pilgrimage.This route through a legendary Sherpa Village follows the historical footsteps of Edmund Hillary and Tenzing Norgay Sherpa, the first two men who waved flag on the top of the world more than six decade ago.The walk from Jiri along the way historical Tengboche Monastery (3850m) actually warms up Everest climbers. Jire to Everest Base camp trekking route offers you mesmerizing Himalayan scenery including Highest peak of the world “Mt. Everest, Mt. Lhotse, Mt. Nuptse, Mt. Amadablam, Mt Pumori, Mt Thamserku, Island peak etc. Not only that you may explore the tradition of Tibetan Sherpa culture and the Monasteries along with the wilderness of its flora and fauna in Sagarmatha National Park. Day 01: Arrival in Kathmandu (1345m/4412ft) Arrival in Kathmandu where a Orbite Nepal Adventure representative will meet you at the airport and transfer you to your hotel . Overnight at hotel. Day 02: Trip arrangements and sightseeing around Kathmandu Valley. This day we will gives you the diteals information about trekking program and coordinate any last­minute arrangements. After/before the staff meeting, we will take you sightseeing with a tour guide to visit the highlights of Kathmandu ­ Pashupatinath, Boudhanath Stupa, Swaymbhunath and Patan Durbar Square. Overnight at hotel. Day 03: Kathmandu to Jiri drive (187 km) 9 hour drive 6 hrs drive to jiri from Kathmandu via Koshi river. Overnight at teahouse. Overnight at teahouse. Day 04: Jiri to Deorali(4­6 hrs ) The trek begins with a steady climb through cultivated fields and tiny Tamang villages. Climbing diagonally, we cross­forested areas and open pasture land, before again descending to Shivalaya. From here it’s a steady climb to the top of the Deorali pass (3000 m) where we spend the night. Day05: Deorali to Sete (2520m )5­6 hrs From Deorali, it’s a short walk to the Sherpa village of Bhandar, which is littered with prayer walls and small gompas (Buddhist temples.) Descending to the valley floor at the riverside town of Kenja, the trail climbs steeply up a ridge richly forested with oak and rhododendron to Sete (2575m) whose beautiful hilltop monastery is worth a visit. Day 06: Sete to Junbesi (2675m )5­6 hrs We climb through fragrant pine and Oak Forest to the Lamjura pass (3500 m) for our first glimpse of Everest. Then it’s downhill again to the large Sherpa village of Junbesi. From here there are good views of Gaurishanker, Number Himal and Dudh Kunda. Day 07: Junbesi to Nuntala (2220m )5­6 hrs From here we walk up the Solung ridge, from where Everest is again visible and then descend to Ringmo Khola, ringed with apple orchards. The trail crosses the Traksindo La (3071m) before descending once again through the forest to Nuntala. Day 08: Nuntala to Khari Khola (2100m )5­6 hrs From Nuntala the descent continues to Dudh Koshi (Milk River) the largest river on the trek. Then ascend through several Sherpa and Rai villages terraced fields and forest to the spread out village of Khari Khola. Day 09: Khari Khola to Puiyan (2800m )5­6 hrs The path ascends through Sherpa villages and a forest inhabited by monkeys, and then winds steeply up and down through the Dudh Koshi canyon to Puiyan. Day 10: Puiyan to Phakding (2600m )5­6 hrs The trail climbs for about an hour after Puiyan to a ridge at 2800m, then up to another ridge, passing the path to Lukla airport, after which we climb on to Phakding. Day 11: Phakding to Namche Bazaar (3440m)5­6 hrs Today begins on level ground, relative to the environment in which you are! You will cross the river on a high suspension bridge and begin to climb up to Monjo (2800m) and on to the gateway to the Sagamartha National Park Entrance in place to protect and preserve this beautiful environment. There is a good rest stop on the way up where you will see people gathered, admiring the first real chance to see Everest in the distance. On the way up today you will be rewarded with views of Kusum Kangaru, Thamserku, Konde­Ri and Tawache Peak before eventually arriving at Namche after about 5 hours. Day 12: Rest day in and around Namche Bazaar(3440 m) Rest day in and around Namche Bazaar(3440 m) with the surrounding mountains views we will take a day rest for acclimatize . this day we will hike up the villeage for the view of Mt. Everest, Lhotse (the 4th highest peak ), and Ama Dablam. we can also visit the Sherpa Museum . Overnight at teahouse. Day 13: Namche to Thame (3800m )5­6 hrs Perhaps one of the most fascinating days of the trek, we travel to the village of Thame (12,464′). Day 14: Thame to Khumjung (3780m)5­6 hrs Waking early we will climb the Thame monastery and further explore local Buddhism including 40 year­old Gompa and learn about its inner workings and the lives of its monks. We will return the same way close top Namche and then we will Climb to Syangboche, then trek to two serene Sherpa villages, Khumjung and Khunde 3890 m where Sir Edmund Hillary established his first hospital and Khumjung 3790 m where he established a school, both in the early sixties. The Khumjung Gompa possess what is supposed to be a Yeti skull. Day 15:Khumjung to Dole (4090m )5­6 hrs Leaving the main trail to Mt. Everest, we will follow high on a ridge to 4000m past a large chorten at the village of Mong, said to be the birthplace of the saint Lama Sange Dorje, the reincarnate lama of Rongbuk Monastery in Tibet who introduced Buddhism to Khumbu. From there we descend to the village of Phortse Tenga by the Dudh Kosi (river). From Phortse the trail climbs steeply through forests of rhododendrons and then stands of juniper and large conifers as the altitude increases. Day 16:Dole to Machhermo (4410m )5­6 hrs In the morning we will follow a steep but beautiful climb through conifer and rhododendron forests and stands of juniper to Lhabarma 4220m and Luza 4360m. There are kharkas wherever there is a flat spot and the slightest hint of water. We continue to climb along the side of the valley, high above the river to the camp at Machhermo 4410 m.
Day 17:Machhermo to Gokyo (4751m )5­6 hrs We will climb a ridge from where the valley opens wide as the trail passes through Pangkha. Mt. Cho Oyo 8153 m dominates the skyline to the north as we climb the moraine on the left flank of the Ngozumpa Glacier. The climb is steep to the first of the four lakes that lie in the Gokyo area but the trail levels off towards the second lake, Longponga at 4690m. We finally ascend a path past the largest of the lakes Dudh Pokhari to Gokyo at 4750m. Gokyo is a typical Kharka stone houses and stonewalled pastures. Day 19: Gokyo to Chhyugima (Dragnag) (4680m )5­6 hrs A long day and the most difficult part of this trek. We will cross the southern end of the Ngozumpa Glacier, pass by the stone huts of Thagna Kharka then climb steadily up a narrow and steep valley which opens up to a wide shallow valley leading to our camp at Kharka Chhyugima 5170m. Day 20: Chhyugima to Dzonglha (4845m )5­6 hrs We descend from the pass, cross a small glacier, we are going to cross the Cho­La Pass 5373m.negotiate the ice fall at the end of it and descend via Leisyasa to our camp at Dzonglha Kharka 4730 m, a high altitude summer pasture directly beneath the north wall of Cholatse Peak 6440 m.
Day 21:Dzonglha to Lobuche (4930m )4­5 hrs Today we will hike on a trail above Tsholo Lake and join the main Everest trail at Dughla on the terminal moraine of the Khumbu Glacier. From Dughla we climb up the moraine past a row of stone monuments in memory of Sherpas who died on expeditions to Everest and on to our camp at Lobuche 4930m. Day 22:Lobuche to Everest Base Camp (5364m)– Gorakshep (5170m )5­6 hrs You will ascend gently to begin with today through lovely pasture lands; you will then follow the rocky moraine path with views of the Khumbu Glacier. Gorakshep is on a flat field below Kala Pattar (5545m) and My Pumori (7145m), it is the original Everest Base Camp. A good spot for lunch after 2/3 hours walk, following lunch you can continue up to the present Base Camp. Day 23:Gorakshep to Kala Pattar (5545m)– Lobuche (5018m )5­6 hrs From here we make a steep ascent to the top of a small peak, Kala Pattar 5545m meaning “black rock”. From here the views is magnificent enough to make us forget the difficulty of the climb. Everest, Nuptse, Ama Dablam, Kantega, Tamserku, Tawatse and Pumo Ri all present themselves in a 360 degree panorama. Day 24:Lobuche to Dingboche (4360m )5­6 hrs Return trek to Lobuche and a short descend to Thukla and an easy flat trail to and a small descend to Dingboche. This is the highest big settlement in the Khumbu area of Sherpas. Day 25:Excursions around Chhukung (5546m )5­6 hrs There are many interesting excursions possible using Chhukung as a base each one revealing ever more spectacular views of the nearby high peaks. For the more energetic the climb to Chhukung Ri 5546m is very rewarding with spectacular views of the south faces of Nuptse and Lhotse and a great view of Kkongma La across the Nuptse Glacier. An alternative excursion is to Pareshaya Gyab, the base camp for assaults on Imja Tse formerly known as Island Peak. Day 26:Chhukung to Thyangboche (3760m )5­6 hrs From Chhukung we descend the valley of the Imja Khola, trek through the village of Dingboche with its stone walled potato fields, down alpine pastures through the kharkas of Tsura, Orsho and Shomare to the village of Pangboche. Leaving Pangboche the route descends past some magnificently carved many stones to the Imja Khola which we cross via a steel suspension bridge high above the river at a spot where it rushes through a narrow cleft. From there we have a gentle climb to the tiny village of Debache past many walls deep in a rhododendron forest. From Debache we have a short steep climb to Thyangboche through a forest of birches conifers and rhododendrons. Day 27:Tengboche to Namche Bazaar (3440m)5­6 hrs Mostly down hill today it will take you 5 hours, there is a steep climb for about an hour before you encounter the scenic walk back into Namche. From Khumjung you can pass through Khunde where you may enjoy a visit to the little monastery if you haven’t already. Day 28:Namche Bazaar to Lukla (2886m)5­6 hrs our walk today descending steeply for the first half then on to Phakding, where you will spend the night. This is your final day trekking; it will take you around 4 hours to Lukla more from Phakding. This evening you will have a farewell ceremony with your guides and porters. Day 29: Lukla to Kathmandu (1300m) You will be on an early flight back this morning, on arrival in Kathmandu you will be met and taken to your hotel.